In less than one week I will be sitting in a plane heading to Tokyo. For the fourth time I set off to a journey to explore this country full of tradition, technology and culinary experiences. In this post I want to outline the route a second time, because since my last post about this topic some plans of mine changed. A while ago I wrote an extensive post about my motivation for this trip, my plans and the destinations I wanted to visit. Since then I changed some parts of the route, however the majority stays the same. Flying in directly to the central Haneda airport with Lufthansa I need little time to reach my accommodation for the first three days, an Airbnb apartment in Shibuya. The next two days I will visit the Winter Comiket for the first time, and I am excited to see how it will be like. A few friends of mine, both from Tokyo and abroad, will be there, too. I hope to spend some time with them. The plan is also to buy all kinds of omiyage, or souvenirs, early on, so I can fill one of my two suitcases and send it to the future me at the end of the trip. Originally, I had in mind to spend New Year’s Day in Tokyo and do the first shrine visit of the year hatsumode before seeing the first sunrise. The day after I would have visited the late Emperor Akihito on the usually private grounds of the imperial palace. 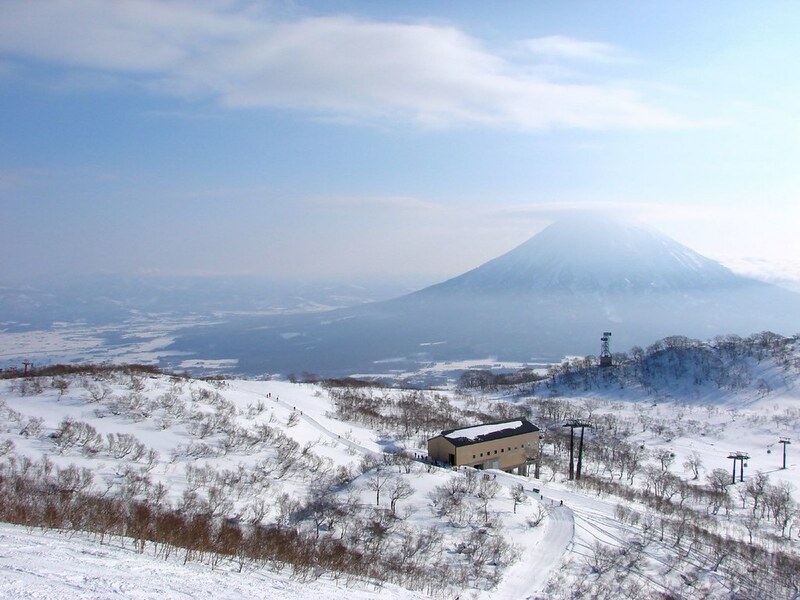 Instead, I will join my friend Casey from the U.S. to a skiing trip in Niseko! Since we got to know each other in Tokyo in 2012 we have met on three different continents over the years. While we knew we would be in Japan around the same time we had completely opposite plans. Luckily, I was able to shift things around on my side to embark on this fun adventure with him! Early on January 1st I will fly to Sapporo from Haneda airport, meet him there and then travel to Niseko by bus. We found a lovely lodge in the middle of the ski resort. Once there, we will go skiing for two full days before I need to leave again for Tokyo on January 4th. Before leaving Hokkaido completely I arranged a half-day in Sapporo where I hope to taste some local cuisine and see a few sights. Late in the evening I will fly back to Haneda. The next day will be busy again, so I booked a “Business Class cabin” in the First Cabin capsule hotel directly insie the airport terminal. 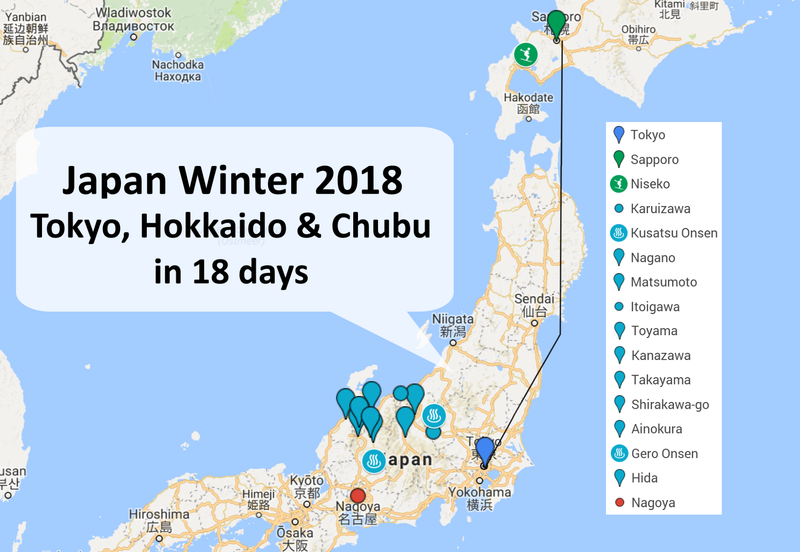 To meet this itinerary, I needed to ditch my plans to visit Aomori, Hirosaki and Hakodate, as well as Chichibu and Kawagoe. Of course, there is always a next trip when I can visit these places. 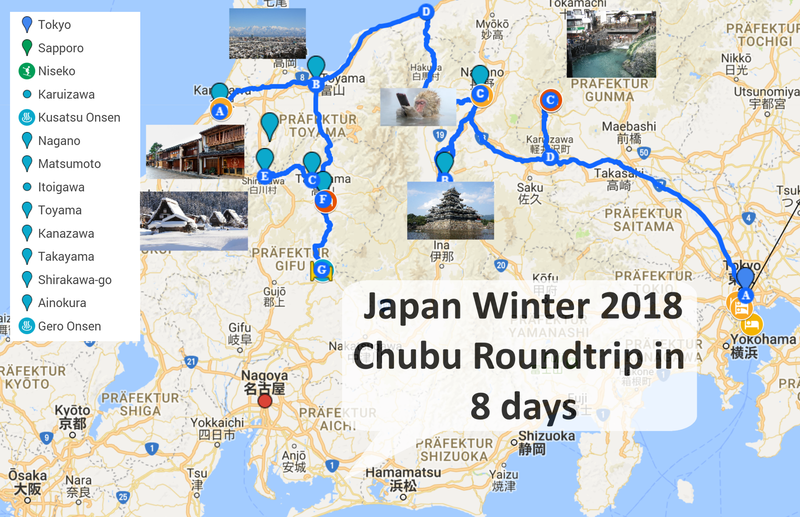 On the following day I meet up with a friend of mine from Tokyo and start my second part of my journey – a round trip to the Chubu region! The first stop is Kusatsu Onsen, a well-known hot-spring village with piping-hot outdoor baths. We arranged a ryokan for a night including a delicious set-course dinner. The next morning, I will activate my Japan Rail Pass and embark on the Hokuriku Shinkansen headed for Nagano. There I plan to stay for three nights to explore not only the city itself but also nearby sights such as Matsumoto and the Snow Monkey Park. On January 9th I follow the course of the train line to arrive in Kanazawa, a town at the coast I visited last time and I enclosed in my heart. From there the ride goes on to the Gifu prefecture, to be exact, I will stay three nights in the culture-rich town of Takayama. From there I plan to do a day trip to Shirakawa-go, and also visit Hida, if time permits. Friday the 12th I head back to Tokyo, so I have a full day to gather the last items and visit a friend. Sunday I have to leave from Narita airport. One good thing I look forward to is that ANA operates my flight back to Düsseldorf. I chose the short stop-over over the direct flight to Zürich for the better amenities and service I hope to find in the Dreamliner. My next post will be from Japan and I will do my best to keep up my streak of daily travel logs. Thank you for reading and catch you soon!